Home / Home / Leuchtturm1917 Pocket Ruled Notebook Review: Even better than a Moleskine! 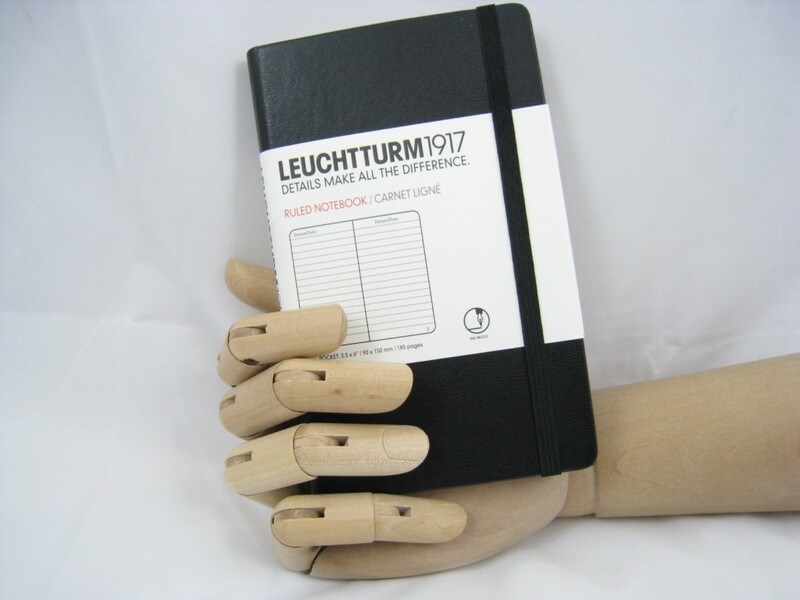 Leuchtturm1917 Pocket Ruled Notebook Review: Even better than a Moleskine! Moleskine notebooks, in my opinion, are overpriced and overrated. A Moleskine notebook doesn’t last for more than 6 months in my hands. After wrecking my latest one, I realized that I needed a change of notebook, something that was durable enough to survive months on end in pockets, bags, and between couch cushions. I also wanted some paper that could stand up to my fountain pen collection. I discovered Leuchtturm1917 at a local art store, and while they’re a little expensive, (At least $14.00 at my local store) I’ve been in love with their notebooks ever since. I had just filled my first one, 4 months worth of writing in it, and there’s barely a stitch out of place. It’s not only it’s durability that attracts me to this book, but the quality of the paper and the bells and whistles that they include. The first thing I noticed about the paper is that it’s off-white, pure white paper has a tendency to blind me when I write in direct sunlight, so this is a welcome relief to my eyes. Another keen feature is that the pages are numbered, so I can keep track of my notes easily in the blank table of contents on the first few pages. The space for the date on each page helps me organize my notes even better. Another great thing about this paper is that it accompanies fountain pens so well. There’s no sign of the ink leaking through to the other side of the page, and the pen glides effortlessly across the page. Something that bugs me though, is the fact that the last 8 pages are perforated. I don’t really see the point in having a feature like that. This is the kind of paper that you want to be kept in books, not torn out like spiral-bound notebook paper. The perforated pages are also numbered, so if you’re a bit obsessive compulsive about keeping all your pages inside of your book, you’re gonna have to make sure the pages don’t come out on their own. 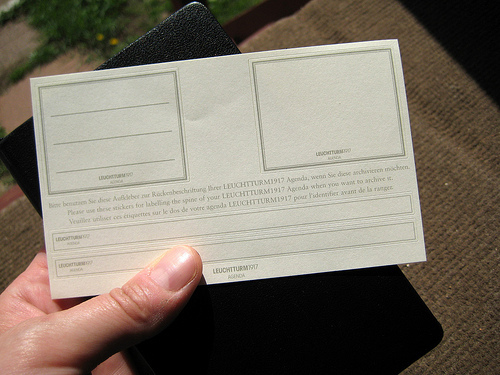 The notebook features an elastic enclosure for the notebook is tight, and keeps the book shut without too many problems. The cloth bookmark that’s glued onto the spine, on the other hand, is frayed at the end, which annoyed me a little bit. Some other bells and whistles include a expandable pocket inside the back cover, which is good for holding small business cards and the like. It’s nice, but overfilling it will make the back cover bend, and that kind of strain isn’t good for a notebook. The notebook also comes with stickers for the front and the spine, for archiving. I like to save these stickers and wait until I’m done with the notebook before putting the stickers on my notebook. Judging from the papery feel of the labels, I don’t think they were meant for heavy travel. Leuchtturm1917 Notebooks provide stickers for archiving your notebooks. The Leuchtturm1917 is of a far better quality than a Moleskine. Not only does it accompany fountain pens well, it also has unique features that make it stand out from the competition, as well as aid me with organizing my notes. If pocket sized notebooks aren’t your thing, Leuchtturm1917 has medium sized and large notebooks for all your writing needs.